South Dakota Senate Bill 6, requiring women to view a sonogram and listen to the fetal heartbeat prior to an abortion, failed in the Senate Health and Human Services Committee on Friday. However, Senate Bill 72, which requires women to sign a state department of health form prior to an abortion, will be seen on the Senate floor. SB 6 was one of two bills discussed at the committee meeting regarding abortion. SB 72 was introduced by Gov. Kristi Noem and will go to the Senate floor for a vote. 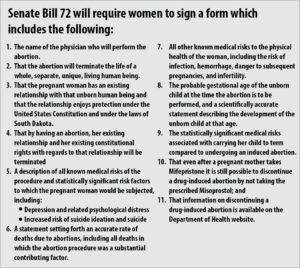 SB 72 will require women to sign a state department of health form that states she is terminating the life of a human being prior to an abortion, that the pregnant woman has an existing relationship with that unborn human being and by having an abortion will terminate her relationship rights with that human being. The form also includes a description of all known medical risks of this procedure and other medical facts related to abortions. This bill was proposed because Planned Parenthood currently does not use the state’s voluntary form before procedures. Planned Parenthood was, however, found to be in compliance with all state laws by its annual audits conducted by the Department of Health. Planned Parenthood did not testify at the committee meeting, but spokesperson Jennifer Aulwes said this form uses graphic language that she believes is aimed to scare women from having an abortion and included medical misinformation. SB 72 was proposed by Sen. Stace Nelson, who also attempted to bring the bill to the Senate floor but failed to receive a two-thirds majority vote. Nelson petitioned the vote and said the bill did not receive a “fair hearing.” Committee chair Sen. Deb Soholt denied his petition and said the bill received an adequate hearing. South Dakota Right to Life opposed Senate Bill 6 as well. The group said the bill could create legal challenges and doctors are already required to offer a viewing of the sonogram.